"Show that you are a beast when it comes to skateboarding!" Game Goal: Travel around the world and participate in skateboarding championships. Perform maneuvers with perfection to beat the other participants. How to Play: On the ramp, you can do various maneuvers, including nose grabs, rocket airs, frontside airs, and coin collecting to unlock new items and characters. Graphics: The scenarios recreate landscapes from around the world, such as the beaches of Copacabana and Miami, Lisbon, Mount Fuji and even the Grand Canyon, providing a fun gaming experience. 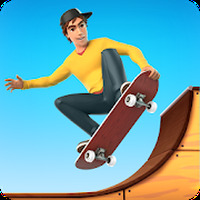 Game play: Flip Skater features simple gameplay, the ability to unlock various items, a daily bonus, and more. Users of all ages will enjoy this game. Controls: To control the character, simply click or slide your finger on the screen. Ranking: The TOP 10 Most downloaded games in Urban Sports Games category. Watch ads to get coins that you can use to unlock new skateboards, scenarios, characters, and maneuvers. Do you like Flip Skater?